What a week! Fall is here! It was 97 F yesterday and 80 F today with rain most of it. I almost got naked and did a thank you rain dance. I’m sure my neighbors were thankful because I rescued them from the ghastly vision of my interesting bits by deciding to go shop hopping instead. It was much more important grab two more shops on the Quilts Across Texas Shop Hop than it was to frighten the rain gods into dumping more water on me in an effort to make put my clothes back on. We got plenty of water today. This past week my friend Jamie reposted a photo of a class sample that I did back in June. She showed off the quilt as you go watermelon table runner. Jamie got a big response from her Facebook peeps and they asked me to teach it again. I will in the spring. I offered to do something “Fall or Christmas” instead. We talked and decided a pumpkin would be very apropos for the next two months at least. So a pumpkin it is. 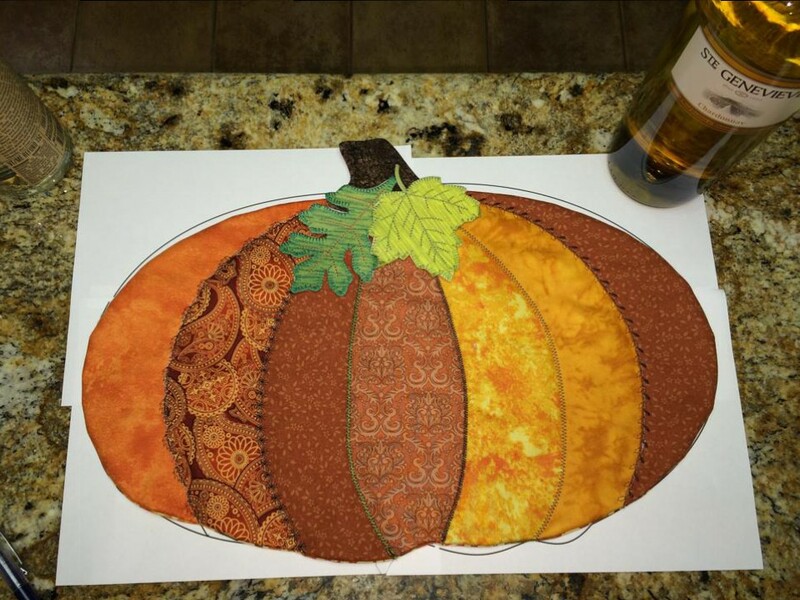 There are some vintage looking quilt as you go pumpkins made of strip piecing. At first I though we’d do that. It would be made just like the watermelon table runner but a pumpkin. Sounds easy. I decided to actually make a sample this time. But as things go in my world I decided to change the plan just a bit to make things prettier. There is absolutely nothing on a pumpkin that is a straight line. So, I decided that instead of strips, we’d do curves instead, easy-peasy no-pin mild gentle curves that would suggest the 3D shape of the pumpkin. Great! I drew out a pattern and it is beautiful! Oh no! I realized we can’t do the stitch a strip and flip it over technique as easily now. We got those curves to deal with. This is intended to be a beginner level class… so what am I to do? I have said all year that I would teach a Fast Piece Applique class à la Rose Hughes style. It’s fun, it’s fast, it gets fabulous results in a short time. Her books are great and I tell my peeps to, “buy them, buy all of them. Rose’s books will inspire you and teach you stuff, she’s great!” I decided that this is my chance to spread the news about the greatness of Rose. However, Jamie and I did put the news out that this is a quilt as you go kind of beginner class. So what to do? I decided we will do Rose’s technique and mangle it into a quilt as you go kind of thing and shorten the process just a bit. I put it together tonight, and because of the big pieces of pumpkin, it will work just fine. I think this is gonna excite my class! I’m excited to share it. 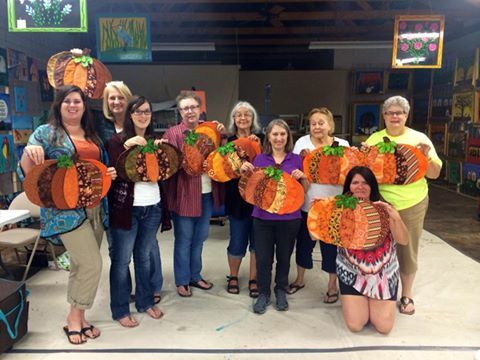 I was really surprised how the process fell together and how it sped up making the whole darn pumpkin centerpiece. And, best of all, it was fun and not that complicated. I’m not going to show how I did it yet… I want to find any interesting foibles by making another sample tomorrow. For now… Here is a pic of what I did in just under an hour and 30 minutes.